What do sellers look for when choosing an agent? Each year, our team embarks across the county for a five day training conference called Keller William Family Reunion. To say there is a lot going on is an understatement! Over 15,000 agents from across the world completely take over a city for these days to improve best practices, educate our selves on market trends, and expand our minds and thinking to grow our businesses. Each day there is a main session taught by co-founder, Gary Keller followed by break-out sessions on particular topics. Of course, as the team’s Listing Specialist, my focus is learning more about what sellers want, what they need and how to get their homes sold for the most amount of money in the shortest amount of time. 1. 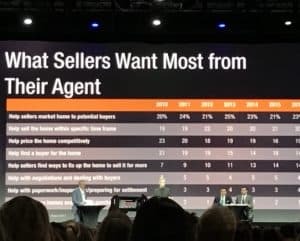 What do sellers want most from their agent? 2. 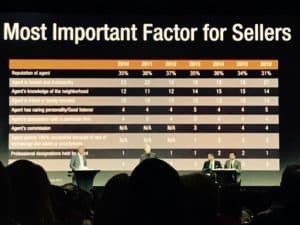 What are the most important factors for sellers when choosing an agent? While the answers aren’t surprising (they have remained consistent for years), I still found them interesting and wanted to take a moment to reiterate how and why The Peters Company keeps our seller’s needs at the forefront of our business. In a nutshell, sellers want help from their agent to MARKET their home to potential buyers, and they choose their agent based on the REPUTATION of the agent. I have great news for all of our clients! First, our marketing plan for selling homes is top notch. The combination of years of practice and the abilities of our talented team means there isn’t a stone left unturned when it comes to our marketing skills. Secondly, we strongly feel that our reputation among both clients and other agents sets us apart. We pride ourselves in being specialists in our field and by maintaining a high level of integrity throughout all transactions. Additionally, The Peters Company is consistently ranked on the top real estate groups not only in Georgia, but also across the Southeast Region. When you’re ready to find the right agent to sell your home, please call us! We would love to share with you our all-star marketing plan for selling listings and show you why choosing the The Peters Company to get your home sold is the right choice!